Get money off our favourite NVMe SSD at Amazon right now—in both the US and UK. It’s all about SSDs at the moment: yesterday saw reductions on the Samsung 860 Evo range at Amazon, and today they’re at it again with the Samsung 970 Evo 1TB (the best NVMe SSD, in our opinion) for $247.99—that’s a healthy saving of 17%. Those in the UK can also benefit from savings on the series and grab it for the reduced price of £219.49, a cut of £54.50 or 20 percent. The rest of the 970 Evo line is on offer too, with savings range from 9 to 20 percent on all the capacities which range between 250GB to 2TB. If you’re not sure what makes an NVMe SSD special, it loads and finds data a heck of a lot faster than standard SATA SSDs (up to four times faster, in this case). It’s also light years ahead of your standard HDD, to the point where an SSD is a must-have if you’re making a new gaming PC build. The Samsung 970 Evo in particular is a great choice. 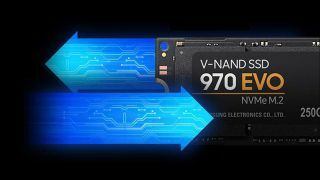 As we mention in our best NVMe SSD list, the “970 Evo line delivers excellent performance, Samsung has a proven reputation for reliability, and there's a wide range of capacities at a reasonable price per gigabyte. Compared to the best SATA drives, the 970 Evo 1TB is four times faster on average. It might not load games any faster than a SATA drive, but you'll know your SSD isn't holding you back”. For more tips on PC components, pay a visit to our page on the best SSD for gaming. Alternatively, find out what the single best upgrade you can make to your PC this year is.